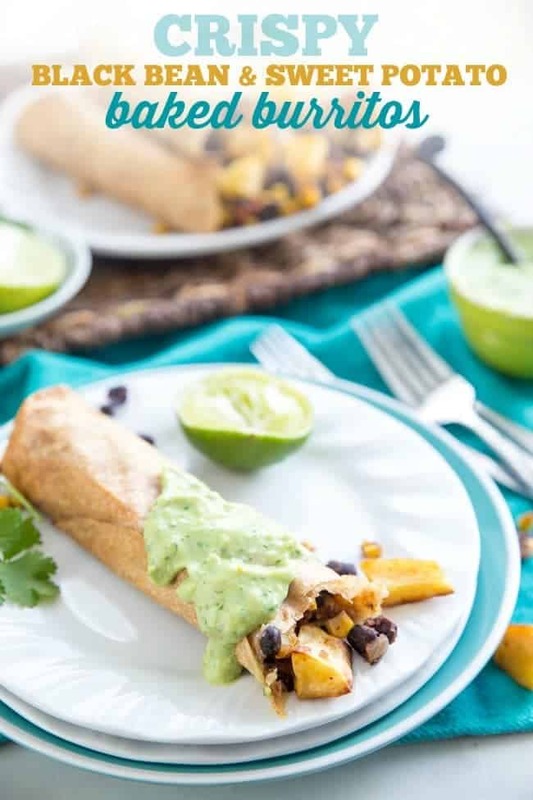 This easy weeknight dish is made with just a few simple ingredients, making it a meal that everyone will love. You know what happens when you start getting completely settled in life? Work is going well for both you and your spouse. Marriage is starting to seem almost easy. Kids are behaving and doing well in school. Your money is under control. Nothing in the house has broken in the last 6 months. Both cars are running well. You’re getting enough sleep AND getting in regular exercise. Life decides it’s time to switch it up and throw you for a loop. This is exactly what happened to my family a few weeks ago and it’s all coming to head this week. We were doing awesome in all aspects of our lives. I came home from picking up the kiddo from school one day, and my wife just blurts it out. Sure, it doesn’t sound like a huge deal, but UGH. Into work at 5pm and off work at 1am. What kind of crap is that?! Family dinner time is the most important thing to me. It’s something I’m a stickler about. No matter what. Even if you aren’t hungry and you’re not going to eat. You will sit at the table for family dinner. Not at the TV (except for pizza & movie night). Not with phones and tablets. Together as a family. So I knew this new schedule would get in the way of that. Among other things. No one to fall asleep next to during the weeks. No after-dinner walks when it warms up. No Friday night date nights. No watching our favorite Tuesday and Thursday night shows when they air. Such a bummer and a total shift in our lives for the next few months. I don’t feel guilty going to my evening workout classes anymore – more Zumba and Body Pump for me! On the weeks we don’t have my son (I have 50/50 custody), I will shift my schedule to wake up at 8am instead of 5am – winning! Although she will be missing out on family dinner time, I love knowing that the food I make is family style, which means there’s always a lot of it and it’s easily reheatable. So even if she’s eating the dinner I made for lunch the next day, I know she’ll love and appreciate it all the same. 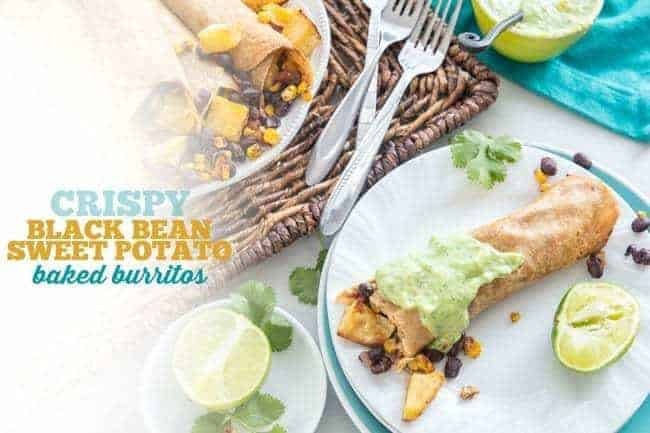 Like these Crispy Black Bean Sweet Potato Baked Burritos. 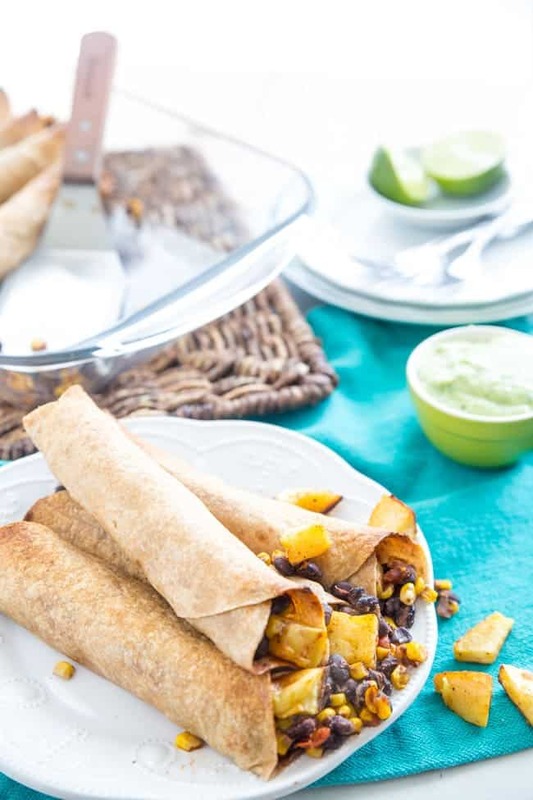 They’re totally easy to make so even though it’s just my kiddo and I, I don’t feel like I’ve wasted a bunch of time cooking just for the two of us. 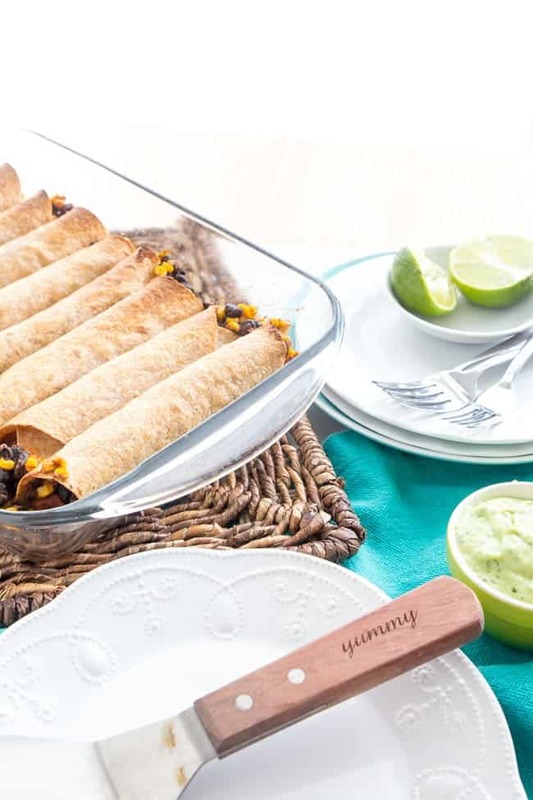 Plus, they’re made with inexpensive, but whole food ingredients, making it simple to make a whole tray of them. 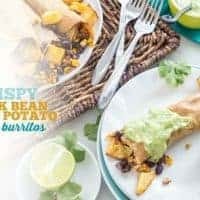 You could probably even get away with doubling the recipe and freezing it for a later day when you just aren’t in the mood to cook. 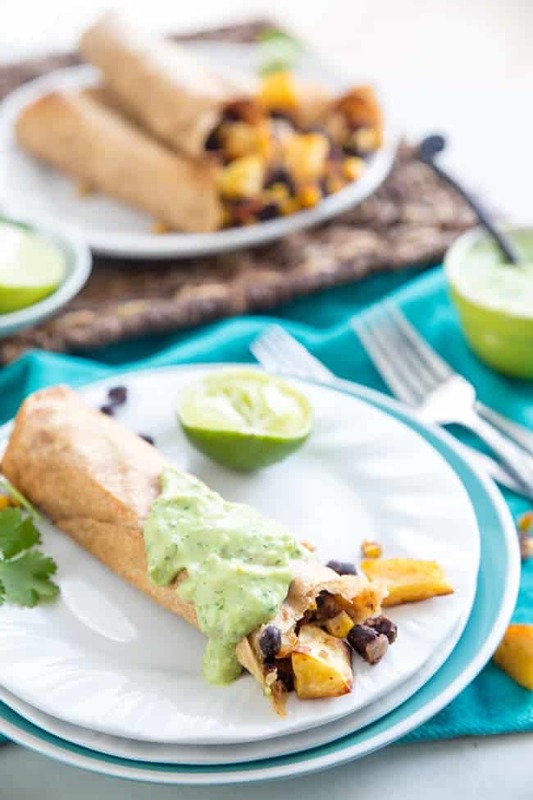 So if you’re looking for the perfect meatless meal that your whole family will love, even for leftovers, these baked burritos are the ones to make. On a large baking sheet, spread chopped sweet potatoes in single layer, drizzle with olive oil and a sprinkling of salt. Bake for about 30-40 minutes or until fork tender. 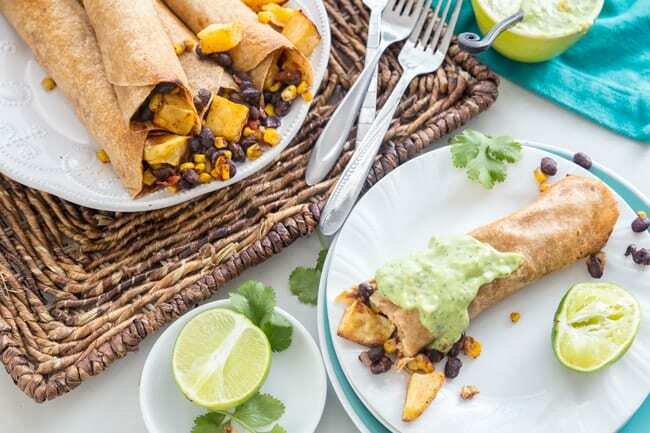 Fill tortillas with sweet potatoes, black beans, corn, and salsa. Roll each one tightly and place in a 9x13 baking dish. Bake for 20 minutes or until heated through and lightly crispy. Place all ingredients in a food processor or blender. Blend on high until all ingredients are combined and smooth. 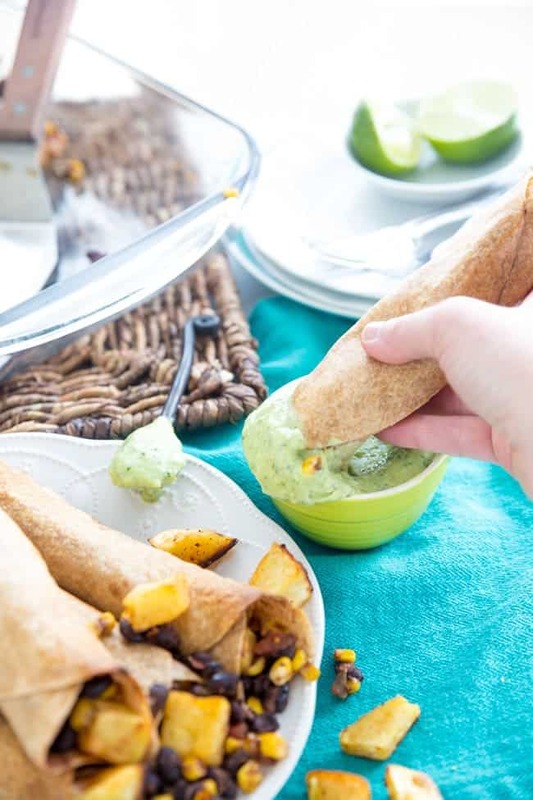 Use as a spread or dip for burritos. Feel free to bake the potatoes 1-2 days in advance, saving on prep time the day of.